Buy through MusicWeb for £12.00/13.32 postage paid World-wide. Himlische Cantorey: Veronika Winter, Julia Kleiter (sop); Henning Voss, Ulrike Andersen (alto); Jan Kobow, Henning Kaiser (ten); Sebastian Noack, Ralf Grobe (bass). rec. Sendesaal des Radio Bremen, Germany, 16 October 2004. Notes in Deutsch, English, Fran�ais. Photos of artists, engraving of composer and of Hamburg. In this secular and democratic age we don�t think of the appointment of a new minister in our local church as anything in particular to celebrate. In C.P.E. 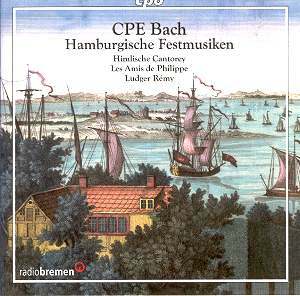 Bach�s Hamburg this was the occasion for an all-day municipal festival including a concert with original music for brass band and chorus. And sermons, of course. Perhaps it was that incongruity which caused scholars to overlook this music for so long, but here we have works which recall the secular cantatas of Bach�s father J.S., music of jubilant celebration and dramatic pageant performed with enthusiasm and excitement by virtuosos. This is one of those marvelous disks you put on to hear a little to see if you�ll like it, then it captures you and you hear the whole disk through; when it�s over you�re sorry there isn�t more. I have said several times that the 21st century will be the century of C.P.E. Bach* and to me this disk is neither unexpected nor surprising. C.P.E. composed superbly for voices and ensembles and now we have a chance to hear a variety of moods and texts. Unfortunately for non-Christians all this music consists of prayers of one sort or another, but we Anglophones can revel in our incomprehension, as we do with J.S. Bach�s cantatas, and accept these pieces as musical poetical expressions. Worse still, all these exhortations to a just and powerful God to guide and protect the people are thinly disguised praise to the aristocracy and celebrations of the dictum: One God in heaven, one Pope in Rome, one king in Hamburg, or whatever the Protestant equivalent of that is. So my advice is, don�t read the texts even though they are unusually well translated. The print is fine; lose your glasses. The solemn chorus �Du bleibst ewiglich...� would fit right into The Magic Flute. Hear the brilliant chorus �Herr Gott du bist unsere Zuflucht...� as an operatic triumph. Accept the beautiful soprano aria, so meltingly sung by Julia Kleiter, �Unwandelbar, welch ein Gedanke!...� as any of many beseeching arias from a favorite opera. These days we take for granted the many fine counter-tenor voices, but Henning Kaiser deserves special commendation for his exquisitely beautiful performance of �Nun, so tritt mit heiterm Sinn...� Think of Jan Kabow�s brilliant declamation of �Wenn einst vor deinem Schelten...� as any of many angry tenors heading off to war. And well they may be such when we finally have revived all of C.P.E. Bach�s operas. Recording quality is exceptional to match the quality of the performance. *We are all aware of the illustrious career of P.D.Q. Bach, but some of Bach�s other brothers were notable as well. C.P.A. Bach and W.M.F. Bach never wrote music, but became very wealthy through international investment in sauerkraut futures. C.E.O. Bach become head of a large financial company. C.P.U. Bach and C.R.T. Bach changed their names to Hewlett and Packard and moved to San Francisco. On the other hand, J.G. Bach never made it out of long pants, and the less said about J.O. Bach the better. **We must remember that when he was preparing his father�s manuscripts for publication or performance C.P.E. had to fill in and recreate many a bar of real Bach here and there when the original was missing or damaged beyond legibility.